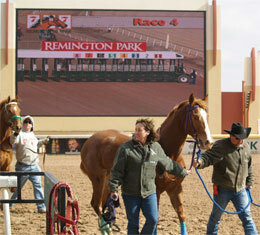 Training races continued on Friday at Remington Park in preparation of the track's opening day March 8. OKLAHOMA CITY, OK�MARCH 1, 2013�Trainer Stacy Charette-Hill saddled three of 11 two-year-old training winner's Friday as Remington Park continued their schooling races in preparation for their upcoming American Quarter Horse Meet, set to open March 8. Hill also had three winners on Thursday's training card. Wolfgang James, a 2-year-old IVORY JAMES gelding owned by Bobby and Vickie Hammer of Elmore City, Oklahoma and trained by Charette-Hill, posted the fastest 250 yard time of :13.35 following an impressive debut in the 8th race. He took the lead under urging and kept to task for the half‐length win. The gelding is out of the first crop of the Brimmerton mare Jess Brimmin To Go, an unraced daughter of Grade 1 winner and producer Jess Genuine ($195,175). Beattie Feathers finished second in that race, tying for the second fastest clocking on Friday of :13.44. After stumbling slightly at the start, he moved up in the middle of the track to challenge for the lead. Also a colt by IVORY JAMES, Beattie Feathers was purchased by Joe Flores, of Mission, Texas, at the Ruidoso Select Summer Yearling Sale for $35,000. Bred in Oklahoma by J. Garvan Kelly and Nancy Yearsley, the brown colt out of Fleeting Touch by Tres Seis, is a half-brother to recent Los Alamitos Maiden Stakes third place finisher Nellie Delaney ($48,858). PYC PAINT YOUR WAGON got another two winners on Friday's training card, while WAVE CARVER sired one. In related training race news, Luis Villafranco saddled Stolin Credits, a $5,000 Heritage Place September Yearling owned by Dan & Louise Jones, to win the final race (13) and tie for the second fastest time of :13.44. The bay filly hustled to the front, took the lead and went on for an easy length score while under wraps. Royal Vista Equine, Inc., agent for Vaughn and Jill Cook, consigned the Stoli filly, out of Grade 3 placed Danika ($29,137), by Special Leader. For a complete list of today's (Friday) training results CLICK HERE. Training race replays are available for viewing on www.oqhra.com.